Do yourself a deliciously awesome favor and whip up a big pot of this yummy keto shrimp and bacon chowder packed with flavor and warmth! 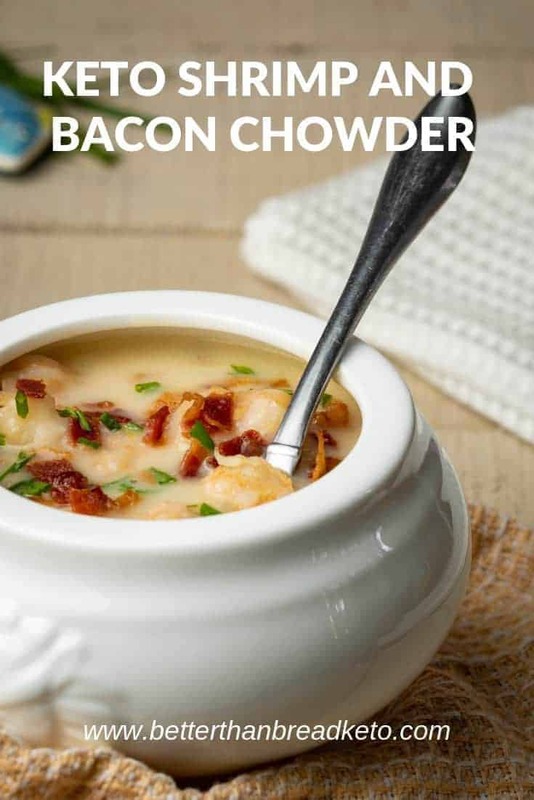 WHAT IS SHRIMP AND BACON CHOWDER? First, let’s answer the question: what is chowder? Chowder is a type of soup or stew often prepared with milk or cream, then thickened with a carb-filled, starchy additive. Often, this additive is crackers, bread, or flour. Here’s a hint: this recipe uses none of those. Typically, chowders include fish, clams, or other kinds of seafood. 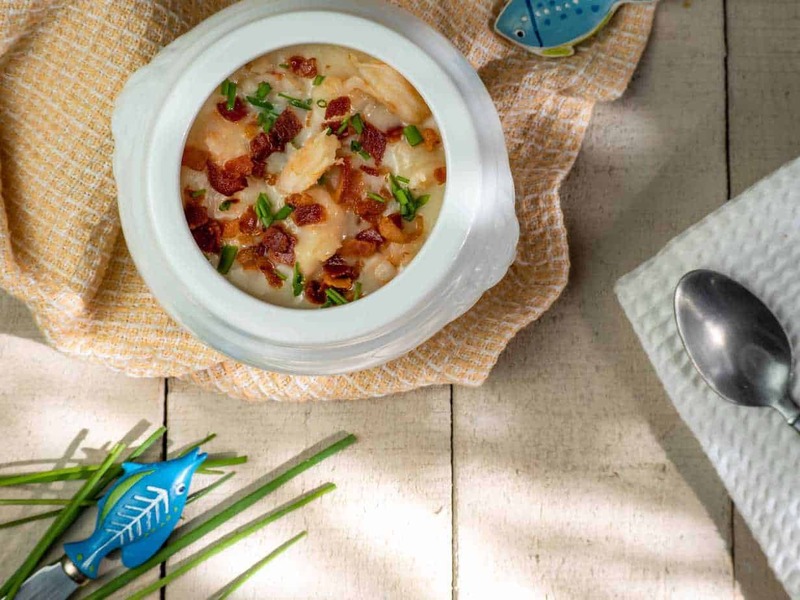 This keto shrimp and bacon chowder is just as delicious as its carb laden friends but is perfect for anyone on a low-carb/keto diet. If nothing else, we are using the explosively yummy combo of shrimp and bacon! How can you resist that?! Below you will find tons of information on how to make this recipe as awesome as possible! 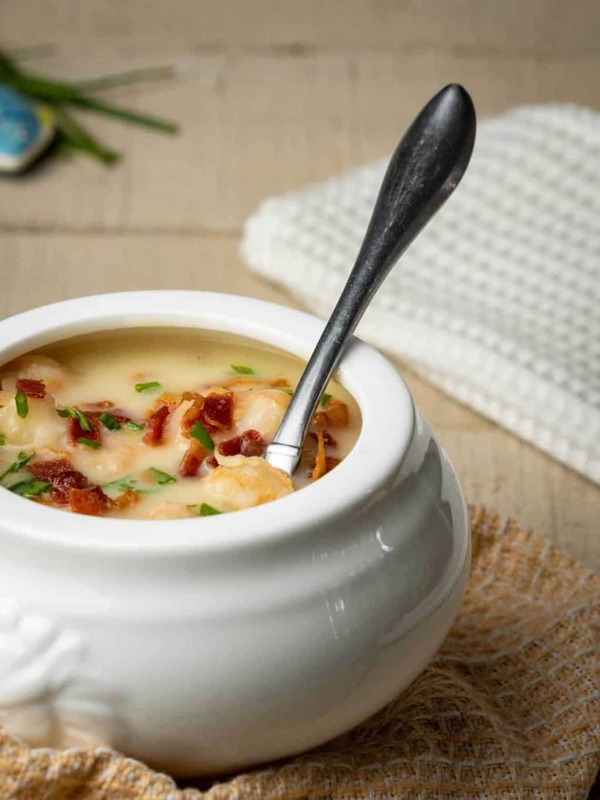 To make this delicious keto shrimp and bacon chowder, you will need the following ingredients. After you have these together, read on below for useful information regarding the chowder and the recipe on how to make it! First, it is important to understand how shrimp are sized for resale. Shrimp are categorized by how many shrimp will found in the package. They are also always sold by the pound. For instance, if the shrimp are very small and generally 60 to 70 shrimp makeup one pound, then the bag or container will have 60/70 on it. Similarly, if the shrimp are very large and only 15 to 20 will make up one pound, they will show 15/20. When choosing the size of shrimp you’d like to use for this recipe, any kind will work. If you want more, smaller shrimp, use 50/60 or 60/70. If you’d like larger, heartier shrimp, use something closer to 20/30 or 30/40. Truly, the choice is yours. They will all cook similarly and taste just as good! CAN I PUT “RICE” IN THIS SHRIMP CHOWDER? Sure! Some chowder recipes call for the addition of rice. Generally, these recipes are more geared toward Mexican-inspired dishes, but not all. Having said that, if you’d like to add some “rice” to your keto shrimp and bacon chowder, your best bet is to use cauliflower. Voila! Easy keto-friendly rice in your keto shrimp and bacon chowder! If you are staying away from dairy or have a dairy intolerance, you can easily make this dish dairy-free. To do this, use coconut milk instead of heavy cream. If you’re not familiar with coconut cream, read on below for some quick information about the wonderful dairy-replacing keto ingredient! Coconut milk is the liquid that comes from the grated pulp of a coconut. The milk is a great low-carb/keto dairy supplement because it contains small amounts of carbohydrates and plenty of healthy fats. IS IT THE SAME AS COCONUT WATER? Not in the least. For starters, coconut cream is more of a cream consistency while coconut water is well… water. Unlike coconut water, which is the liquid found directly inside a coconut, coconut milk is the result of crushing coconut pulp. SO DOES COCONUT CREAM TASTE LIKE COCONUT? In our experience, the cream does have a slight coconut taste. To be clear, this taste is not overwhelming but if coconut isn’t one of your favorite flavors, it might be a deal breaker. When adding the cream to other ingredients with strong tastes, such as shrimp and chicken broth, the coconut taste will be diminished. We aren’t huge fans of the taste of coconut, but can easily tolerate coconut milk in recipes. WHERE DO I GET COCONUT MILK? Coconut milk is easy to buy. Almost all grocery stores carry it in canned form. Unlike most canned ingredients, buying canned coconut is perfectly fine. Generally the coconut milk is mixed with some water to dilute the mixture, but often contains no other ingredients. If you run across Thai Kitchen brand coconut milk, it is acceptable to use. It is mass produced, but generally available everywhere including big stores like Walmart and small stores like your local grocery. There are tons of other brands, I am sure, but as always, be sure to check the nutrition info and ingredient list to be sure that particular brand is ok. In a large pot, cook bacon until nice and crispy. Remove the bacon, let cool on a plate with a paper towel, then crumble. Add finely chopped onion to the pot with the remaining bacon grease and cook until lightly sautéed. Add chicken stock (or shrimp stock, if you prefer; see below for information), heavy whipping cream, salt, and pepper to the pot. Bring to a boil, stirring regularly until mixture begins to thicken. Add shrimp and crumbled bacon. Simmer until shrimp are pink and chowder is the desired consistency. Ladle into a bowl or other serving dish and warm your bones! CAN SHRIMP STOCK BE USED INSTEAD OF CHICKEN? Sure! Shrimp stock will actually heighten the delicious shrimp flavor in this dish. If have the time to make shrimp stock to use in this dish, you definitely won’t be disappointed! CAN I USE STORE-BOUGHT SHRIMP STOCK? If you’re fortunate enough to have the option of store-bought shrimp stock (we aren’t around here), theres a good possibility it is full of lots of unnecessary ingredients. So, as always, we urge you to take a moment and check out the ingredient list. Chances are, the list is full of preservatives and other nasties. Having said that, making your own is the best idea! WHAT OTHER INGREDIENTS CAN BE ADDED? There are a few ingredients you might consider adding to this keto shrimp and bacon chowder. Adding these ingredients are personal preference and are not necessary for the chowder to taste extraordinary. Keep in mind, some of these ingredients will add some net carbs to the recipe, so make sure to keep track of that as you make these optional additions. If there are other ingredients you’d like to add, feel free. After all, part of cooking is taking recipes and making them your own. As mentioned above, be careful to monitor the additions for added carbohydrates. WHICH IS BETTER? FRESH OR FROZEN SHRIMP? The obvious answer here is fresh shrimp. This is especially true if you live near an area that has a large body of water and an avid fishing community. These are probably the freshest shrimp you can find and they are absolutely delicious! These shrimp will have the best, freshest taste, especially if cooked the same day they are bought. Of course, most of the time you have to buy these at a fish market, and a lot of the extra work is left up to you. This sometimes includes removing the head, shell, and deveining the shrimp. Reality is, of course, a lot of us do not live near an area like this, so frozen shrimp is our only choice. If you’re lucky, you might even find shrimp that have been frozen in water, which I have heard is one of the best-kept secrets to deliciously frozen shrimp. You might be able to find this in the “fresh” seafood section of your grocery. Otherwise, you’re stuck with the bagged frozen shrimp. These are just fine and will not have a bad taste. 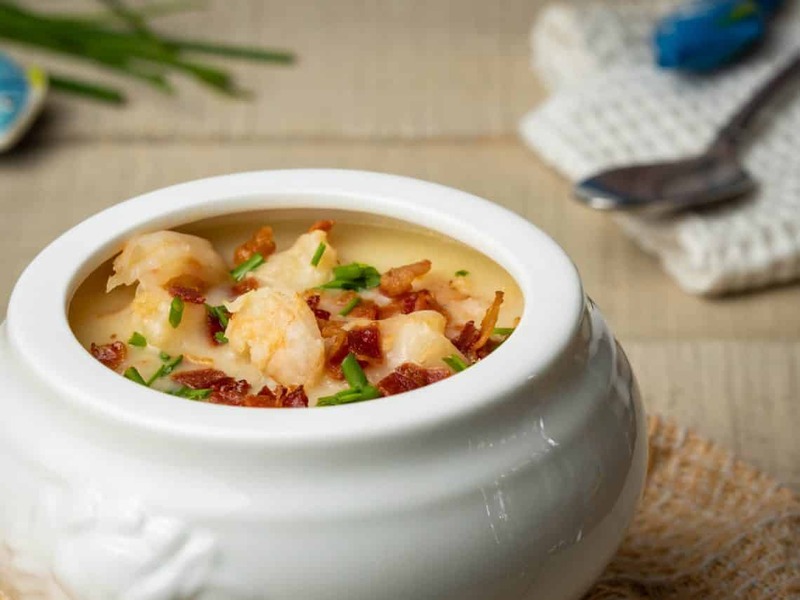 Refer to the shrimp sizing information above when choosing your frozen bagged shrimp for this keto shrimp and bacon chowder. The best way to store this keto shrimp and bacon chowder is in an air-tight container and in the refrigerator. As always, we suggest storing this in a glass storage container. It will store well in the refrigerator for 3 – 4 days. You should make sure to eat it during this time. If it not eaten in this timeframe, the best idea is to discard any remaining chowder. CAN I COOK THIS CHOWDER IN A SLOW-COOKER? Sure you can. We don’t have exact times for this, but only cook the liquid portion of the chowder first. About half an hour before you intend to serve it, add the (thawed if frozen) shrimp to the slow-cooker to cook. Otherwise, cooking the shrimp for the entire time will have them turn out tough, chewy, and very overcooked. Reheating shrimp and bacon chowder is very easy. Below are several ideas of ways to easily reheat leftover chowder for a second helping or another meal! The best way to reheat this chowder is to place it back into a pot or saucepan and heat over medium heat. This ensures the chowder heats evenly and the shrimp do no overcook and become tough and chewy. While this method does take more time to reheat the chowder than the microwave, it is considered the best method because of its general speed and ability to not toughen and cook the shrimp any further. The quickest way to reheat the shrimp and bacon chowder is in the microwave. As mentioned above, if you choose to reheat in the microwave, you run the risk of overcooking the shrimp and making them tough. If using the microwave, heat the mixture in short segments, stirring each time. As soon as it reaches the desired temperature, remove and serve. The other method that works well is reheating in the oven. This is especially useful if you are wanting to reheat the entirety of the leftovers. If you stored them in a glass baking dish, this is especially easy. Preheat the oven to 350˚F and bake for ten minutes, stirring occasionally. Remove from oven and check to ensure the desired temperature has been reached. If not, continue to heat for three-minute increments until the chowder is warm/hot enough. WHAT SIDES ARE GOOD WITH THIS CHOWDER? There are several sides that would be delicious with this dish. Shrimp Stock – If you decide you want to take the flavor of this up a notch, shrimp stock can make it happen. If you have access to it or can make your own, it will really transform the dish. Check above for more information regarding the use of shrimp stock in this dish. 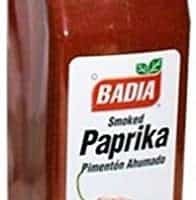 Smoked Paprika – This ingredient is one of our favorite spices. The amount of delicious smoke flavor it can impart to a dish is second to none. In addition, the red color it adds to dishes is wonderful! Xanthan Gum – Xanthan gum is not necessary, but may be something you decide to add to this chowder. Xanthan gum helps to thicken the mixture, which can also be accomplished by letting the chowder reduce down into a thicker state. Though an optional ingredient, if you use it you’ll never know it was there! Ladle into bowl and warm your bones! Loagn, you mentioned coconut water compared to coconut milk then mentioned coconut cream. Is there a difference between the milk and cream? Yes, there is a big difference between the milk and the cream. It’s kinda like the same difference between regular milk and heavy cream. that I just peeled. I just boil it and keep tasting for the right flavor. I make a new soup for my husband every week. 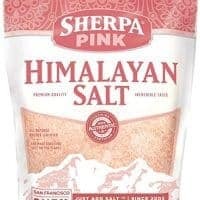 I chose this as I didn’t do an extensive shopping trip and I knew I had all of this in my cupboard (except the salt and heavy cream). My husband is diabetic so I look for low carb recipes which Keto tends to deliver. I thickened milk with corn starch. I added 4 chorizo sausages and 2 cups of sharp cheddar. He could not believe how good this was. He also could not believe how easy the recipe was to get that flavor! Thank you for sharing this! Hi, I’d love to make this. Do you know about how much xanthan gum to add? There really isn’t a set amount. I would start with 1/8 tsp and see how that thickens it. Then, if you’d like it thicker add tiny pinches (make sure to stir) until it reaches the desired consistency. Hope this helps!